The "next Senna" is a label that has been applied to a number of aspiring Formula One stars since the Brazilian legend was killed, but there is one young driver the title really does fit. Ayrton Senna's nephew Bruno is on the verge of an F1 drive next year after impressing in the GP2 feeder category and, without wanting to get carried away on a driver who is not even in F1, the 24-year-old is already showing some similarities to his uncle. Bruno, the son of Ayrton's sister Viviane, is quick in the rain, good on street circuits, calculating, intelligent, and shares his ability to recall the behaviour of his car in intricate detail. But it is his physical resemblance to Ayrton, who was killed in a crash during the 1994 San Marino Grand Prix, that is most striking. Bruno is hardly the spitting image of the three-time world champion, but there are distinct similarities - to the extent that talking to him is a mildly disconcerting experience for anyone who followed Ayrton's career. Bruno has the same liquid brown eyes, the same soft mouth, and he has inherited many of the same mannerisms. There are fleeting moments - a sideways glance, a look - when it could almost be Ayrton sitting opposite you. Bruno is well aware of this, and tells a story about a day he was driving one of Ayrton's old McLarens at the Goodwood Festival of Speed historic car event. "Many of the old race-team mechanics were preparing the car, and one of them was one of Ayrton's mechanics," he says. "I went to the truck to get changed and when I was coming out this guy was coming back in. My face can be quite reminiscent of Ayrton's, and this guy just stops, freezes, and legs it - just runs away. "He was like, 'What the hell is going on?' This guy was in shock for the whole day." Senna laughs as he tells the story, but there is a less amusing side to reminding people of such an iconic figure. So powerful was Senna's image that he has assumed in death an almost god-like status for some, and Bruno has to deal with that on a regular basis. 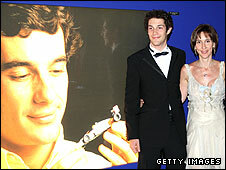 "It's because people have such a strong feeling about Ayrton," he says. 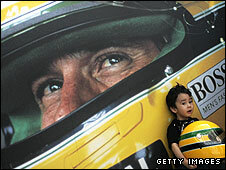 "Japan [where Ayrton was hugely popular] is quite interesting. In Monaco, there are quite a few people who just follow me around. "And there are two sides - the people who loved him and they have transferred their love to me, and the people who loved him, and they doubt me, and they don't want me to do anything." For some this constant comparison with a family member would be hard to take. When 1997 world champion Jacques Villeneuve was in F1, for example, he practically refused to talk about his father, the legendary Ferrari driver Gilles. It was frustrating for the media, even if you could see where he was coming from - he wanted to be treated as his own man. Senna, though, accepts it as natural, and seems to deal with it with grace, charm and equanimity. "I try to just be myself and not be too bothered about it," he says. "It is something that if I become famous myself, I'll have the strange things happening to me as well. "I think it's a great school, to be honest with you, of how to deal with people and your career. I've had a mild introduction to what can come in the future. I think that's good preparation. "For me, it's natural that people ask me about Ayrton. I've been answering the same questions for four years now, and I'm fine with it." It probably helps that Ayrton's global mega-fame meant Bruno and his family had to address this potential problem from the outset, starting with what he called himself as he embarked on a career in motor racing. 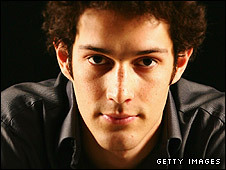 His name is actually Bruno Senna Lalli - his father was killed in a motorbike accident not long after Ayrton's fatal crash - and you would think it might have been tempting to hide Bruno's identity. After all, being the nephew of one of the greatest racing drivers of all time was always going to bring pressures - to deliver, to live up to Ayrton's legacy. But there was apparently never any doubt about what he would call himself. "That was the first thing we thought about," he says, "and we realised there was no point whatsoever in not using the Senna name because the first person who realised I was related to Ayrton would blow it up, and everybody would go 'Bruno Lalli is Bruno Senna', and that would disappear very quickly. "They would say you are being a hypocrite, not using your name, trying to hide from something. And there was no point being Bruno Senna Lalli, because people would just call me Bruno Senna. So we just made things simple." There is no doubt that being called Senna has helped Bruno's career. Former Grand Prix driver Gerhard Berger, a close friend of Ayrton's, has advised him throughout, and it has made raising sponsorship much easier. But there have also been hurdles to overcome. "In the beginning," he admits, "it was hard to cope with the pressure of everything. "There was never an obligation or a need to live up to the name," he says. "It is natural for people to fail and if I had I just go down and that's it. "But there was a responsibility not to make a mess or do something my family would not be proud of, of making sure the image of the name was not going to be changed." Equally, Bruno, who started racing karts at home in Sao Paulo, Brazil, when he was six years old, did not race for a decade after Ayrton was killed when he was 10 because his family withdrew their support for his hobby. As a result, Senna has missed out on the years of experience of most drivers at his level, and has had to fast-track his career fearing he was dangerously close to being too old to make it in F1. His first season in a single-seater championship was in British Formula Three in 2005, and that came after just a handful of starts in Formula BMW the year before. But by 2006, he was winning races in F3, and Berger advised him to move up to GP2 for 2007. After a learning year, he is now second in the championship at the halfway stage, and fresh from a remarkable drive to victory in the rain at Silverstone. It has been a steep learning curve, and the result is that should he make it to F1 next year - and it is said that Berger is already poised to give him a seat at Toro Rosso, with other teams also interested - he will arrive there with far less experience than his rivals. As a consequence, there will inevitably be concerns he might be a bit under-cooked to enter such an exacting and unforgiving environment. Senna says he is not worried, though, and after the rapid progress he has made perhaps he is right. Certainly, it is profoundly impressive that he has managed to progress so far, so quickly, on such little experience. 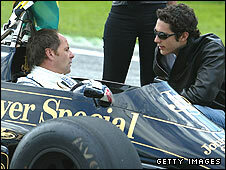 And Paul Jackson, the man who runs Senna's iSport GP2 team, is in no doubt he has what it takes. "The future is very bright for him," Jackson says. "He's shaping up to be extremely good. "He learns very quickly, he's come on in leaps and bounds and he's beginning to become the full package. "He missed out for 10 years, but he's proving it's possible to fill the gap - he seems to have made up ground and is now level with the others. "He's a very clever, intelligent guy, and he's shown he's exceptionally talented. "I do believe he'll be ready for F1 by the end of the year. I'd be surprised if he didn't turn out to be very, very successful in F1."